The Brexiteer and former Work and Pensions Secretary said she will enter the running for the top job if she has “got a fair shot”. On Wednesday, prior to the indicative votes in Parliament on a possible eight alternative Brexit options - which were all eventually rejected - Mrs May told Tory MPs she would step down if her deal is eventually passed in the commons. This would allow someone else to lead the next phase of negotiations as the UK faces a race against time to finalise details of the UK’s future relationship with the EU. Theresa May's withdrawal agreement was rejected for a fourth time on Friday and despite this adding to the uncertainty over when she plans to step down, as many as 20 MPs are now in line for the top job. Ms McVey is the latest minister to suggest she will run for the Conservative Party leadership, and told The Times: “People have come forward and said they’d support me. The former Work and Pensions Secretary also believes there should be a female included on the final list of candidates voted on by MPs. “That would show we represent everyone - I believe in meritocracy and I believe in reaching out to all kinds. The Tatton MP came in for heavy came in for huge criticism while at the Department for Work and Pensions, and was forced to apologise for misleading the Commons when downplaying a crucial report on Universal Credit reforms. She resigned from her post last November in opposition to Mrs May’s much-criticised Brexit deal, but has performed a u-turn and backed the plan in last week’s Commons votes. Boris Johnson has been tipped as a favourite to take over from the Prime Minister, and has been holding meetings with Tory MPs in his bid to rally support. The leading Brexiteer has also received backing from Jacob Rees-Mogg, chairman of the European Research Group (ERG). Foreign Secretary Jeremy Hunt and Home Secretary Sajid Javid are also understood to be sounding out party support for their leadership bids. Other potential candidates include former Brexit Secretary Dominic Raab, Commons Leader Andrea Leadsom, Health Secretary Matt Hancock, and Environment Secretary Michael Gove. More than 20 MPs could enter the leadership challenge, with Nigel Evans, chairman of the backbench 1922 Committee, joked there would be “more runners and riders than the Grand National”, in the race to succeed Mrs May. In her interview with The Times, Ms McVey continues to admit the Brexit plan Mrs May is putting to Parliament is still a “bad deal”, despite voting for the withdrawal agreement in Parliament on Friday. The former Work and Pensions Secretary also warned the continued delay and confusion around Brexit is creating anxiety around the country. 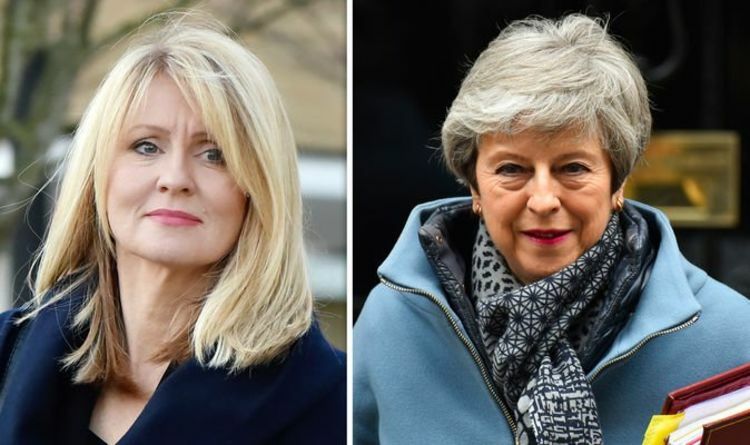 The decision from Theresa May to step down as Prime Minister once her Brexit deal has been passed through Parliament has also been welcomed by Ms McVey.